Prior to joining Plan B, Hailey spent the past few years freelancing for a variety of companies and worked as a Visual Designer & Front-End Developer at Dabble. She led the rebrand for the Chicago startup’s website launch and gained experience developing modern, branded digital advertisements. These days, her clients include McLaren, Loyola Medicine, Mather LifeWays, and PreparedHealth. She prides herself on her ability to look at the big picture and to collaborate with both account and creative to push the limits of design. Her love for web design and perfecting typography has shaped her passion for UI/UX design. She aims to design for the user (and not for the designer). Hailey finds comfort in interior design Pinterest boards, thrift stores, and experimenting with the latest fashion trends. She even started her own clothing design and retail business during her college years. 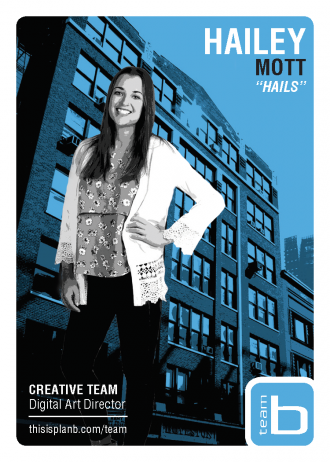 She graduated from Columbia College of Chicago with a BFA in Graphic Design and a focus in Interaction Design, but Hailey originally hails from Bloomington-Normal, IL.